Tomorrow morning I will be attempting to complete my first 50 mile ultra marathon. Deep. Breaths. Today, I’m overflowing with a mix of emotions. It’s hard to explain, really. I haven’t felt this emotional about a race since my last Ironman (two summers ago). And I really didn’t expect to be experiencing these feelings today. But, I woke up this morning to a Facebook post from my little sister, and I almost started to cry. It was with this one, simple message that I realized I was absolutely, positively, terrified of tomorrow’s adventure. Scared to the point of a shortness of breath and being on the brink of tears…24 hours BEFORE the race starts. I’m not a mushy, emotional person. At all. But today, I have been on the verge of tears nearly ALL DAY. The Facebook messages and text messages keep coming from friends and family. And with every message, my eyes are watering up and my stomach is filling with butterflies. 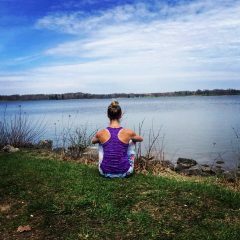 As with one other race I’ve done, I decided to dedicate every mile of tomorrow’s run to someone who needs it. I just finished getting my arms all tatted up with their names. It was with this simple gesture that I finally felt a small amount of peace about tomorrow. 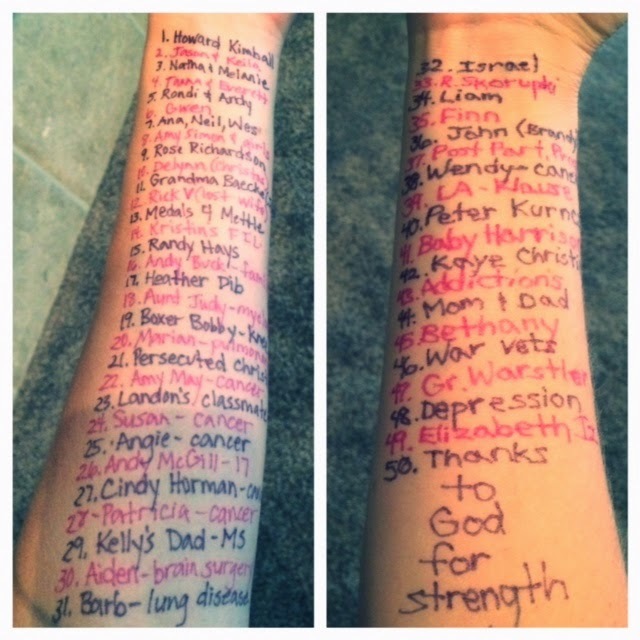 Writing each of those names helped me to remember how blessed I am to have the strength and ability to run 50 miles. And now, I’m feeling full. Full of hope for a great run. Full of thanksgiving for so many wonderful friends and family who are supporting me from afar tomorrow. 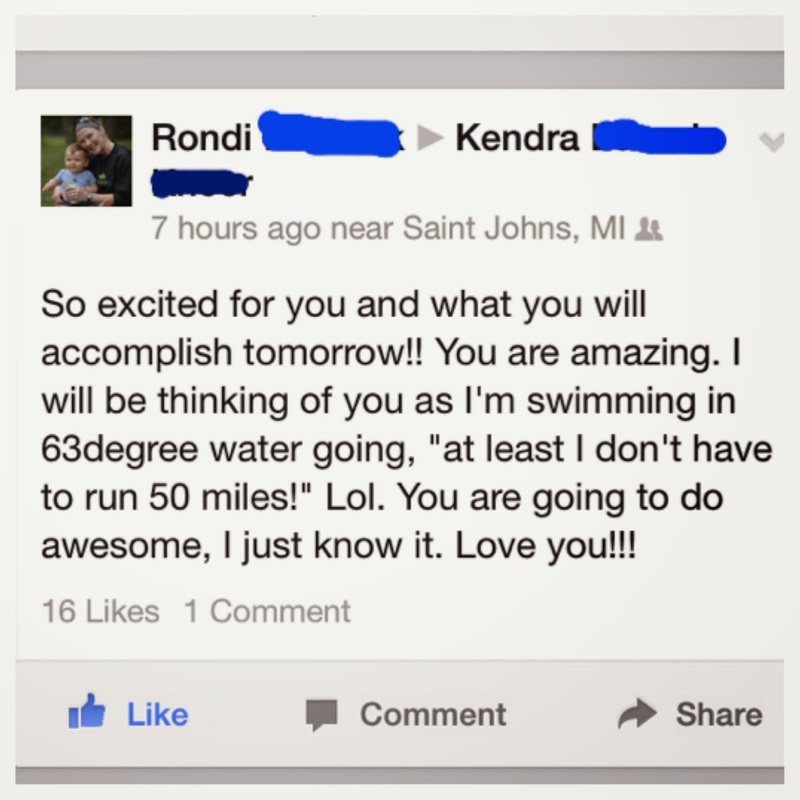 So proud of you Kendra!! You are amazing!! Of course, a small part of me thinks you are a little bit crazy to even think of running 50 miles. But more power to you for getting out there and doing it!!! Thanks so much for coming out and supporting me in this adventure! Your help after the race was amazingly wonderful!!! Love you! Next Next post: Hurts So Good.